Born in Spartanburg but raised in Myrtle Beach, Tyler joins Tim and Barry, completing the trio that manages our brick and mortar store, Low Country Pipe and Cigar. Marked by an easy-going personality, calming confidence, and sarcastic sense of humor, Tyler's the type of person you can't help but want to light up a cigar with, making him all the more perfect for his work as Retail Sales Associate. Combine that with years of experience in the cigar industry, and Tyler comes well prepared, fitting seamlessly into his role here at Laudisi. 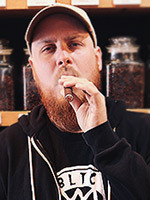 While he loves cigars, Tyler's a sort of "Tyler-of-all-trades," with his interests spanning into the realms of art, music, world cultures, and Boston sports. When he's not helping customers at Low Country, you're most likely to find Tyler with his son, Kai, and dog, Odin, both competing for the title of "Goofiest Creature on the Planet," and if he ever is able to find some time to himself, Tyler enjoys winding down with video games or obsessing over 90's wrestling. So, come down to Low Country Pipe and Cigar and spend an hour or two or three with Tyler, or Ty, or whatever you want to call him — just don't call him late for dinner.